As we tread closer to the long awaited Detective Comics issue #1000, we find ourselves still wondering who is behind the monster attacks on teachers and mentors from Bruce Wayne’s past. Each issue so far has taken a familiar face and has attempted to deliver us a threat to justify seeing them again, in this case some bizarre polymorphic monster squad that knows a good deal about Batman iconography. Well, what hasn’t worked yet has still left me optimistic for change as we find ourselves nearing the end of an arc, but has the newest issue had any more to offer in the way of quality storytelling? This issue, much like the rest of Tomasi’s current arc, has been double shipping an absolutely stagnant, pointless plot. While you can blame DC for believing that double shipping is the answer to industry woes, one would also think we could actually cover more ground at a faster pace, which is just not the case here. Since the beginning, we’ve had almost nothing to grab onto in the way of conflict. 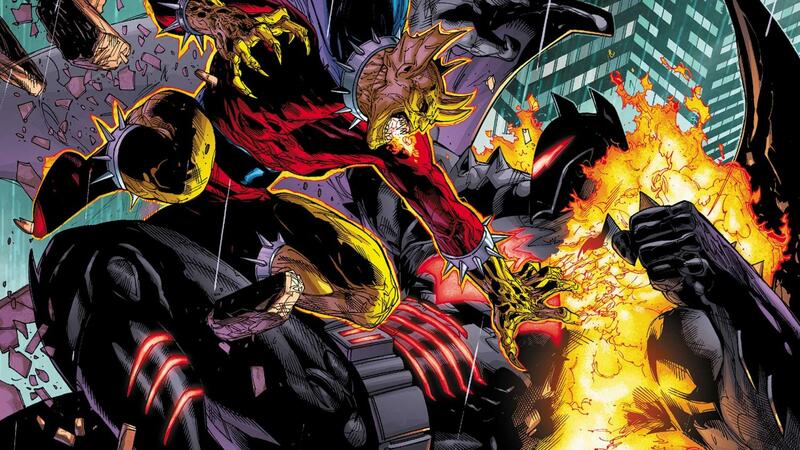 A "faceless" enemy is terrorizing Batman for some unknown reason, which is then used as an excuse to mine Batman history and kill or threaten people that have had absolutely nothing to do with the current Batman storylines. Now, much of comic book joy comes from left field appearances and cameos, but the entire run so far has been only been relying of “cover candy,” or appearances made to sell the book. I’ve said this in nearly every review so far of this run, but this is some of the most edgy, somewhat cheesy Batman dialogue since some of the mid-90’s stuff. “What makes you think I’m afraid of Hell? !” (10) Batman yells, punching a demon in the face… There’s just not much here in Batman’s characterization that lines up well enough to how he’s portrayed in any other current title, and this is one of his main books shipping right now. Look, I know Tomasi can write a good Batman, as we all have seen in his successful Batman and Robin during the New 52 era, but this reads like a Batman fan comic. I’m all for camp in comics, Justice League International and Dennis O’Neil’s Bronze Age Batman stuff is my lifeblood, but this just doesn't work. Mahnke’s art is fine here. Nothing spectacular, but it all works well enough and highlights some pretty decent action panels. Movement and pacing feels choppy, but the panel layout is interesting. David Baron’s coloring in this issue worked well. What could have been an interesting use of vignettes featuring these characters of Bruce’s past has instead turned into a non-plot to string them all together. I really don’t see this arc delivering on anything other than getting us to the big #1000. I really hope I’m wrong, of course, but we only have one more issue to see how any of this fits together.